Teachers use social media in order to have instant, comfortable and effective way to communicate and transact with students. Online classrooms also are becoming more and more social. So why not use these methods that are already in wide use as a teaching tool? Social media began as an entertainment tool, then became a marketing phenomenon, and now is seen as a new pedagogical tool. The Marketing Information System course aims in offering students (the tomorrow marketers) an in-depth view and understanding of information systems that support an effective way the marketing activities. MIS is the process of connecting people, processes, and technology. The use of ICT has changed the way marketing decisions are made. On the one hand, using information technologies supports achievement of a current marketing strategy while on the other hand these technologies set new marketing rules, and social media is the technology that represents a unique way of transmitting information in all directions. So with one concept (social media), we can achieve multiple benefits. 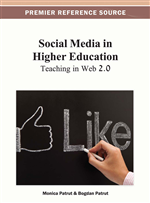 This chapter (1) provides a literature review (overview) of the current use and benefits of Web 2.0 or so-called social media tools in the support of teaching or pedagogical process, (2) offers a systematic way of understanding and conceptualizing online social media as a teaching tool, and (3) suggests the framework in which social media tools can be applied and used in the Marketing Information System (MkIS) course both as part in the course structure and as a mean to teach MkIS. Students today want new, effective and fascinating teaching methods. They dislike and do not tolerate passive learning. A novel approach to solve this problem and motivate the learning process is with the use of Social Media. Students already use social media (in text messaging, chat, Facebook, Twitter etc.). Nowadays, as information (more and more) is available everywhere and mainly on the web, people need the skills and knowledge to find, access and use it effectively and this necessitate the information literacy (Islam and Tsuji, 2010). Marketing professional need information to forecast changes in product demand, increase selling productivity and manage sales and distribution expenses (Proctor, 1991). Coinstantaneously, decisions concerning product development, new markets and response to competitor activity can be improved by good marketing information (Kitchen and Dawes, 1995). As stated above the need for marketing information is not new but in the contemporary extreme antagonistic, complex and dynamic economic environment, the translation of data into information relevant to management decisions is vital to the long-term survival of a business (Romeiro-Serna and Garmendia, 2007). Lin and Hong (2009) consider marketing information being mainly descriptive, based on observation and its goal to provide managers with general enlightenment about an ongoing competitive market situation. Marketing is a process that requires particular management philosophy and especially accurate, authoritative and timely information. Marketing plays a major role in any organizations. Marketing is “the activity, set of institutions, and processes for creating, communicating, delivering, and exchanging offerings that have value for customers, clients, partners, and society at large” (American Marketing Association, January 2008). In the case of products, the basic of marketing is condensed in the 4 Ps (product, price, place, promotion) and in services the 7 Ps (service product, price, place, promotion, people, process and physical evidence). The concept and the practice of function-oriented marketing have been fundamentally reshaped and it is still shaped and redefined (Xu, 1999). As Brady et al. (1999) indicate, marketing is and will continue to be heavily influenced and conditioned by Information Technology (IT). But there are certain constraints to what IT can do and of course IT cannot work miracles by itself. And those organizations that are willing and have the ability to fully embrace IT for their marketing applications will be able to compete effectively (Leverick et al., 1997). But in the 1990’s, the application appeared to concentrate on functional support, rather than strategic support (Xu, 1999). IT to enhance operating efficiency - application of IT to marketing activities that were already in practise in the organization, such as making presentations or analysing sales statistics. IT and changed methods - application of IT to enable the department of marketing to complete internal functions that were extreme possible before. IT for enhancing customer service –use of IT for providing better and faster communication with customers and customer market support. IT and marketing innovation – services like on-line databases; direct mail services etc.